This is one of the few speaker systems in the world capable of reproducing the grandeur and dynamics of a symphony 0rchestra. The system comprises 2 towers each containing 30 tweeters and 15 midranges, and a electronic crossover and 2 bass bins each containing 2×18″ subwoofers. As is the system requires 2 power amps-one for the midrange towers and one for the bass bins. Alternatively it can be used as a sub/sat system using the towers for the mids and highs and a subwoofer/subwoofers for the bass. I have used them in both configurations successfully. The crossover has been overhauled recently and brought upto date with modern capicitors and other electronics. This system was sold by me originally about 15/16 years ago and at that time retailed for around $100,000. 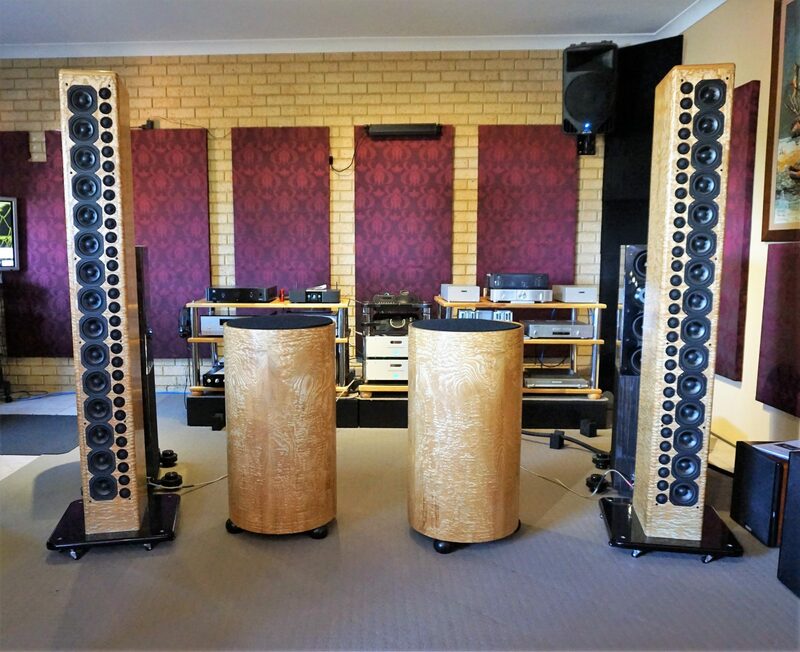 It is probably the only Pipedreams Loudspeaker system available in Australia. Room Requirements – They will perform best in medium to large rooms with tweeters on the inside and towed in slightly, with the listener sitting at the apex of an equilateral triangle. Amplification – As the towers are very efficient (93 db), they could easily provide adequate sound pressure level with a 25 watt amp, however they are capable and would sound better with a larger amp of say 100 watt or more. The bass bins require a good high current/high power amplifier to drive and control the bass affectively. Sound – The beauty of this system is it’s capability of reproducing voices and instruments as per their original size. Most large speakers when playing vocals tend to magnify the voice so much that one would think the mouth of the performer is a metre wide – not so with these. Everything is in perspective. In a large room the bass will easily go down to 20hz and below and the dynamics (120db) and scale of the music is breathtaking. Playing this system using it’s own bass bins, I am not able to distinguish when the bass bins take over from the towers. The detail from these speakers and the presence where human voice is concerned is excellent. I was going to keep this speaker system, but have decided against it, because of it’s size and my inability to move them around easily.